During the Holiday Season, life can get busy really fast. Our recipes can help you get a healthy, speedy dinner done, even on those busy nights. 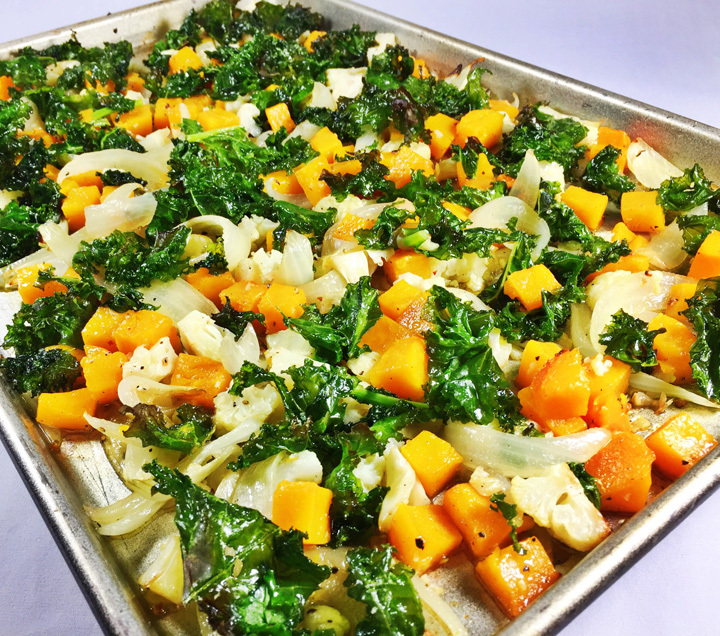 It all starts with one sheet pan of roasted vegetables. Delicious on their own served with a “grab and go” deli-roasted chicken or ham, or with one of the other three recipe options. To save time, purchase from the grocery bagged, already prepped veggies! Preheat the oven to 375 degrees. Place the first three ingredients in large bowl; toss with ¼ cup of olive oil, 1 teaspoon of salt and ¼ teaspoon fresh ground pepper until well coated. Place on a sheet tray and bake for 20 minutes. Add the greens to the same empty bowl; toss with 2 tablespoons olive oil and ½ teaspoon salt. Remove the sheet tray from the oven after the initial 20 minutes and add the greens on top of the veggies. Place back in the oven and roast for another 10-15 minutes until the greens have wilted and their edges are brown. Use immediately or cool and then refrigerate until needed. Preheat the oven to 350 degrees. Place the roasted vegetables and shredded chicken in an ovenproof container and reheat them for 15 minutes. Over medium-high heat in a large saucepan melt the butter and then add the onion. Cook until tender about 5 minutes. Add the rice and cook in the butter until the rice starts to sizzle, about 3-5 minutes. Add the broth and bring to boil. Stir in the rice and follow the package directions for cooking time. Remove from heat, and let stand 5 minutes. Pour into a serving dish, fluff with a fork and then top with the warm chicken and vegetables over the rice; serve immediately. Make 6 servings. Preheat the oven to 350 degrees. Place the roasted vegetables in an ovenproof container and reheat them for 15 minutes. Place the pine nuts on a sheet tray and bake in the oven for 8 minutes. Remove and set aside. During the last 10 minutes of roasting the vegetables, cook the pasta. Drain and reserve 1/2 cup of pasta water. Add the hot pasta, pinenuts, and veggies to a large bowl. Gently toss until well mixed. Add the reserved pasta water and 1 cup of Parmesan cheese stirring to make a sauce. Serve with the remaining Parmesan cheese. Makes 6 servings. Preheat the oven to 350 degrees. Place the roasted vegetables and chicken in two separate ovenproof containers and reheat them for 15 minutes. While the vegetable are reheating, make the cilantro sour cream. In a small bowl, mix the sour cream, lime, and cilantro with salt and pepper to taste. Remove the chicken and vegetables from the oven. Add 2-3 tablespoons of roasted winter vegetables to each warmed tortilla shell. Serve with the cilantro sour cream, warm shredded chicken, salsa, and lime quarters on the side. Serves 6. Breakfast can be the forgotten meal on Thanksgiving or any busy Holiday morning. 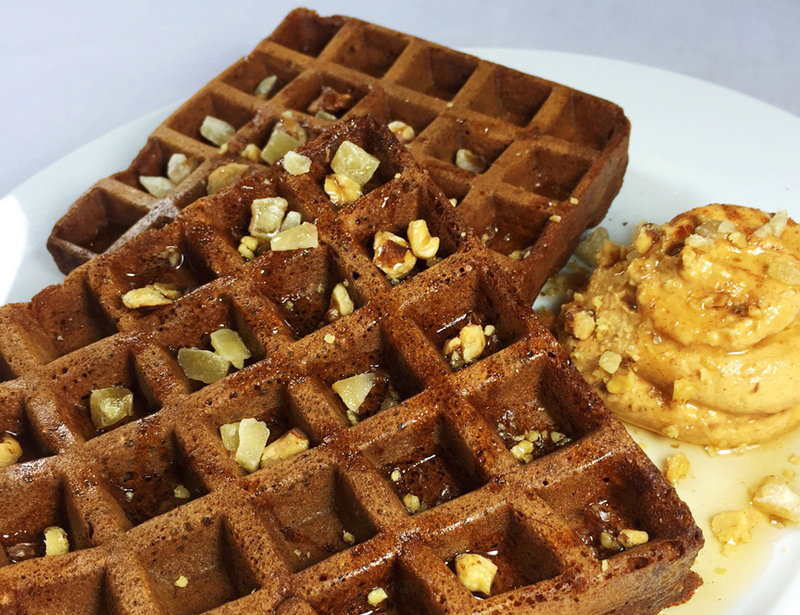 Our Gingerbread Waffles are an easy “go-to” breakfast when made ahead of time and frozen. They can simply be reheated and served. Offer the waffles with syrup and toppings such as toasted walnuts, extra candied ginger, plus one of our special whipped cream toppings. It’s definitely worth picking up the Dark Muscovado sugar – it adds a great Gingerbread flavor. It can be found, along with Candied Ginger, at the Fresh Market and Whole Foods. Set a wire rack on a baking sheet. Place the eggs, milk, molasses, and butter. Place in a bowl and whisk until well combined. Combine the flour, cinnamon, cloves, ginger, nutmeg, baking soda, salt and sugar in a large bowl and whisk to combine. Make a hole in the flour mixture and pour the egg/milk/molasses/butter mixture in the center, careful whisk to form a smooth batter. Add the candied ginger and stir in with a wooden spoon. Heat a Belgian waffle iron and cook the waffles according to the manufacturer’s instructions. Transfer the waffles to the wire rack on the baking sheet to cool completely. Repeat with the remaining batter. When completely cool, stack with a small piece of parchment paper in between each waffle and carefully wrap in plastic or place in a freezer bag; freeze. To reheat on the morning you are serving – preheat the oven to 350 degrees. Place the waffles on a parchment lined sheet tray and heat for 00 minutes. Offer toppings such as toasted walnuts, additional candied ginger, and maple syrup. For an additional treat, see our Holiday Special Toppings below. Toasted Walnuts – Preheat the oven to 350 degrees, Place ½ cup chopped walnuts on a sheet tray and toast for 10 minutes. Cool completely and place in a airtight container. Whipped Cream Toppings can be made the night before and refrigerated. Using a hand mixer, beat 1-1/2 cups of whipping cream until soft peaks form. 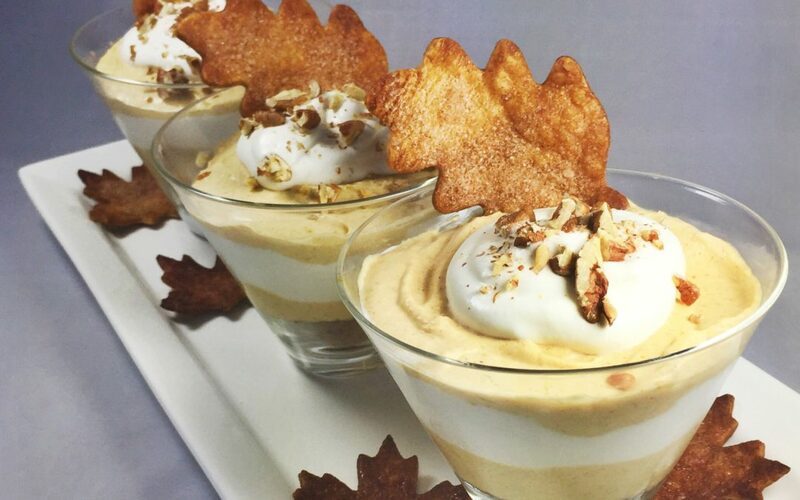 Add 2 tablespoons of powdered sugar, 1/4 cup of canned pumpkin, 1 teaspoon of cinnamon. Beat until still peaks form and refrigerate until ready to use. When serving, top with finely crushed walnuts and a drizzle of syrup. Using a hand mixer, beat 1-1/2 cups of whipping cream until soft peaks form. Add 2 tablespoons of powdered sugar with 1/2 teaspoon of peppermint extract. Beat until still soft peaks form and refrigerate until ready to use. When serving, top with crushed candy cane. 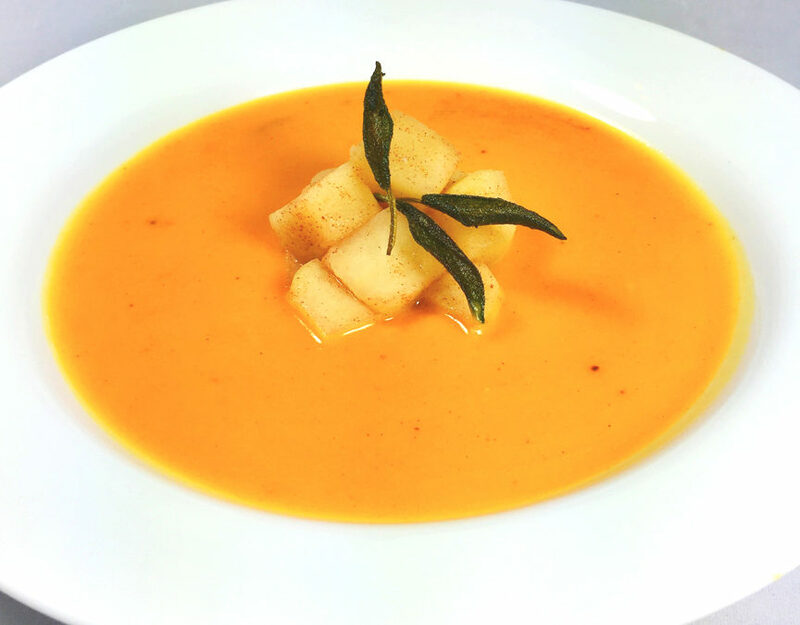 The combination of butternut squash and sweet potato is heavenly and creates a smooth luscious soup. With the addition of cardamom and Vouvray Wine, the flavor is rounded out with sweet and acidic notes. If you want to skip the cream, this soup is so thick you can just substitute with ½ cup of more stock. If you’re not fond of sage and apples, we’ve included below the recipe some other great ideas for other soup accompaniments! Vouvray Wine can be substituted with any sweet acidic white wine. In a stock pot melt the butter over medium heat. Add the onions with a pinch of kosher salt and sauté until soft, about 10 minutes. If the onions start to brown, reduce the heat; you want to just “sweat” them. When the onions are soft, add the garlic, cook for 30 seconds, then add the wine. Increase the heat and cook until the wine evaporates. Add the squash, sweet potato and six cups of stock. The vegetables should be completely covered in stock so add a little more if you need it. Bring to a simmer, then reduce and cook, uncovered, for 1 hour or until the vegetables are soft. Mash with a potato masher then using an immersion blender or a counter top blender, blend everything until smooth. Add 1 teaspoon salt and 1/4 teaspoon pepper or season to your preference. Whisk in the cardamom and cream. Serve in warm bowls and add your favorite accompaniments shown below. Accompaniments – choose your favorite, or mix and match to combine them! Sauté 4-5 small sage leaves in 1 tablespoon of olive oil until crisp; cool on paper towels then crumble. Top the soup with 1 tablespoon of Crème Fraîche and add a pinch of fried sage leaves and fresh ground pepper. Preheat the oven to 350 degrees. Place 1/4 cup of pepitas on a small sheet tray. Toast for 10 minutes. Add a tablespoon of sour cream to the bowl of hot soup. Let the sour cream melt for 30 seconds, swirl the sour cream with a fork then add the toasted pepitas. Preheat the oven to 350 degrees. Combine one small Granny Smith apple, peeled and cubed, with 1/4 teaspoon cinnamon and 2 teaspoons melted butter. Place on a sheet tray and bake for 20-25 minutes or until the apples are tender. Place the apples, mounded in the center of a shallow, warm soup bowl, then add the soup around the apples leaving an “island” in the middle. Use the directions above to make fried sage leaves. Use the leaves whole or crumbled. Combine one small Granny Smith apple, peeled and cubed, with 1/4 tsp cinnamon and 2 teaspoons small diced butter. Vacuum pack and cook sous vide for 30 minutes at 185 degrees. Place the apples mounded in the center of a shallow, warm soup bowl. Add the soup around the apples leaving an “island” in the middle. Use the directions above to make fried sage leaves. Use the leaves whole or crumbled.